»I often stream when I'm alone. It's so nice to have it on in the background. Then there is no silence, and I don't feel so alone«, says Elvira Broberg, 22 years old. »Streaming is just another way to relax. But you should never start streaming if you have other plans later that day. Because then you can't untangle yourself from the screen«, says Emil Bach Andersen, 25 years old. »The suspense was always interrupted by commercials when you watched movies and TV-series on the TV – it was so annoying. You always had to change between channels to find something that you wanted to watch. When you stream; you can watch exactly what you want, whenever you want to«, says Master Kevin Gichuhi Jessen, 29 years old. »My family and I stream a lot. I do it when I workout, cook dinner or in the bed right before night time. I do it while I train to forget that I am training. 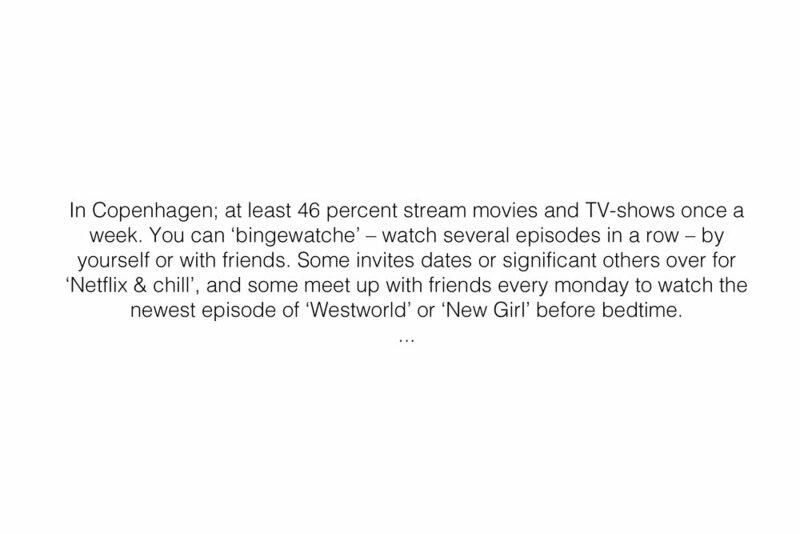 Then I often watch something entertaining like «Jane the Virgin» or «Pretty little liars»«, says Merethe Tangstad Knøfler, 33 years old. »I stream because it's easier to watch movies and TV-series that way. I'm entertained and distracted from my everyday life at the same time. I get sucked into a whole other world«, says Eline Christoffersen, 22 years old.